You don’t have to be a fan of superhero movies to enjoy Aquaman. You don’t have to read comics to enjoy Aquaman. And you’re not required to have seen any of James Wan’s horror movies to enjoy Aquaman (although there are details and elements from all three worked into the script by each of the credited writers). Aquaman has seemingly been the lesser member of the Justice League for years. Robot Chicken has been ridiculing the character for a long time and Entourage destroyed any possible feature-film adaptation based on the character from HBO. That makes the Warner Bros. decision for choosing a veteran filmmaker who was best known for his work within the Saw and Conjuring franchises for creating this possible franchise film an encouraging one. 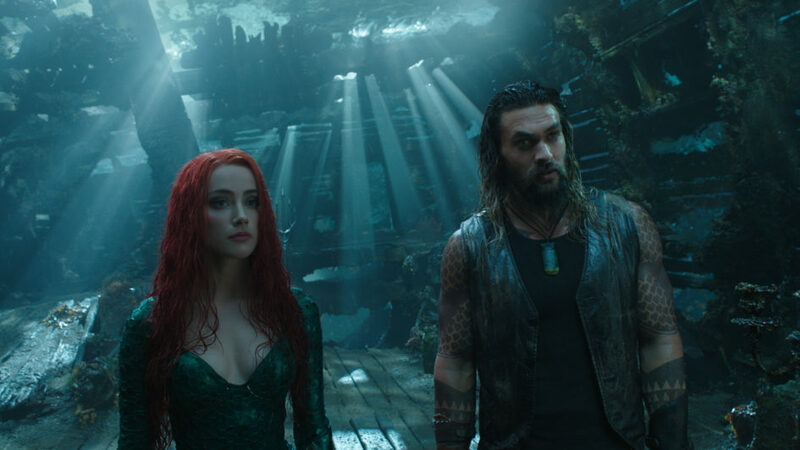 Director James Wan has crafted a movie depicting a hero emerging from land who unites the seven kingdoms of the sea and takes his rightful place onto the throne of Atlantis one that’s a wild ride for audiences. Arthur Curry’s origins span from the New 52 by DC Comics. Jason Momoa is Arthur Curry and throughout the film’s two-and-a-half-hours of run time (more on that in a minute), he eventually becomes the hero known as Aquaman. Momoa doesn’t seem to back down from doing his own stunts or engaging in some straight-up wrasslin’ moves (there’s shades of Khal Drogo on the screen), shining in the underwater spotlight. This version of Arthur Curry has superhuman strength and is virtually indestructible. But that doesn’t stop his half brother, King Orm (Patrick Wilson, previously from the Conjuring films, in a great villainous role) from battling for the throne. It also doesn’t stop Black Manta (Yahya Abdul-Mateen II) from getting a great side plot, hopefully being an ongoing thorn in Arthur’s side for many movies to come. Officially clocking in at two hours and 23 minutes, this one needs a little editing. The first 20 minutes could’ve been quickly summed up in a few flashbacks, but since they involve telling Nicole Kidman’s backstory, they’re kept and the movie runs a little long. I mean, it’s Nicole Kidman! *sigh* There are many moving parts of the ongoing storyline. As it stands, it’s a very good movie. But it probably could’ve been shortened into a great one. The only time the movie underperforms is when light-hearted jokes are inserted into the dialogue. They often fall flat, but not enough to take away from the overall experience. Zack Snyder’s contributions to the DC Cinematic Universe continue with this film and I’m unsure if that is a good or a bad thing. After the mediocre Man of Steel and the almost unspeakable Batman v Superman: Dawn of Justice, (Let’s please forget about Suicide Squad!) he almost singlehandedly shut down the prospects of any future DC big-screen depictions, let alone crossovers within the DCEU. But then Wonder Woman was released and it was groundbreaking (which may have been more a result of Patty Jenkins’ efforts, than his contributions). Aquaman might be better than Wonder Woman (although I really enjoyed the latter). Definitely don’t judge this one on Snyder’s uneven superhero track record. You really should give it a chance and watch it in a movie theater, because it’s a great experience. There’s plenty of action (beware the Kaiju!) and TONS of CGI and a few jump scares, but the absolute scariest element of the movie is Pitbull’s cover of “Africa,” which felt incredibly out of place. Other than that, Aquaman proves that quality films can come from horror filmmakers in other genres and they should definitely get more opportunities in Hollywood.